CreatorsVault.com has always emphasized to “Protect Before You Expose Your Creative Projects in The Marketplace”. As noted previously, this is accomplished by Registration for Copyright Protection at CreatorsVault.com, U.S. Copyright Office, WGA or other valid agencies. All of these Copyright Registrations can be used as evidence in a legal proceeding (Court Case, Arbitration Panel, etc.). 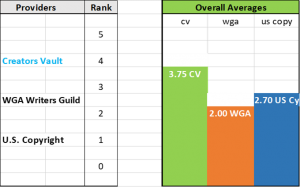 The bottom-line conclusions indicate that CreatorsVault.com provides the Best Overall rating compared to WGA and U.S. Copyright Office. CreatorsVault.com IP Registrations can be accomplished online at https://www.creatorsvault.com/registration/. Since 2006, we have provided BETTER VALUE & MORE OPTIONS in terms of Rates and Term, New Drafts and Renewals at a Discount, and more. Be sure to Protect via Copyright Registration !